The Guild at The Banks. North Building has a large ‘120’ sign on the front (and is next to the police station). Enter hallway and use the elevator to proceed to your room. The first digit of your room number correlates to the floor you’ll be staying on. Follow the hallway & room numbers to locate your room. Do note, you will be responsible for alternative garage parking fee. If you park in one of the above garages, please let us know to avoid any additional fee from The Guild. Drive up to the gate and enter garage access code (provided via text/email). The gate will open, giving you access to the garage. Drive up the ramp, turning right until you reach the 2nd or 3rd floor. If the space you park in is not a number listed above then you risk being towed. Enter through the second set of double doors and locate the elevators to your right. If you’re staying in the North Building (Building 120) (provided via text/email), take the elevator to your floor. Exit the building and cross E Freedom Way. Your building is directly across the street. Enjoy a pool (closed thru Spring), clubroom, and fitness center. You can access the clubroom and fitness center WITHOUT a building fob via the hall in the middle of both rooms. All building amenities are located in the South Building (building 121). Press the "Schlage" button on top of the keyless lock to secure the room. Please & thank you for keeping our spaces safe! Walking? Take the elevator or stairs down to "Street Level/Ground Floor." Enter through the lobby and exit through the doors onto E. Freedom Way. Driving? 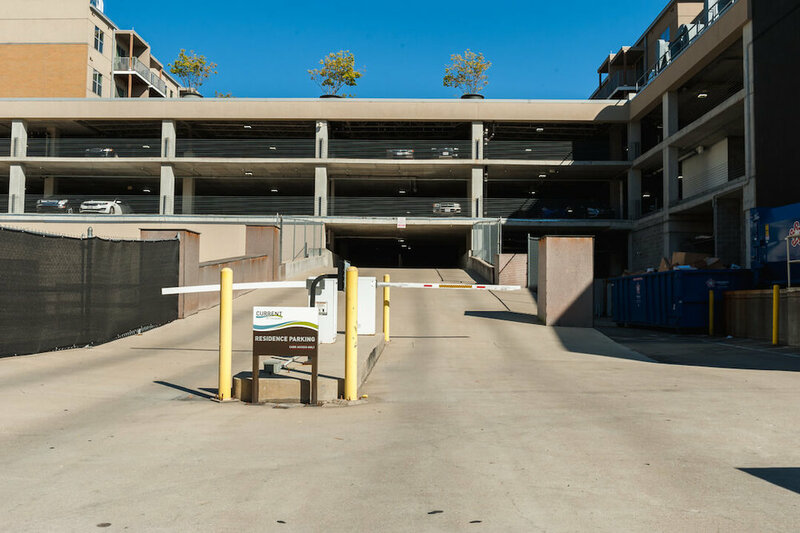 Take the elevator in the North Building (Building 120) up to The Guild-Reserved Parking on either the 2nd or 3rd levels and follow the exit signs to the gate. Simply drive up to the gate and it will open, sending you on your way!